Rogers Corporation is a global technology leader in specialty materials and components for consumer electronics, power electronics, mass transit, clean technology, and telecommunications infrastructure. With more than 180 years of materials science and engineering experience, Rogers provides product designers with solutions to help them power, protect and connect our world with greater reliability, efficiency and performance. 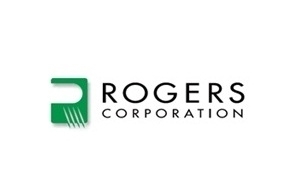 Rogers’ three core businesses include Power Electronics Solutions for high-voltage rail traction, energy efficient motor drives, wind and solar power conversion; High Performance Foams for cushioning, sealing and impact protection in tablets and smart phones, aircraft, rail and automotive interiors, sporting goods, apparel and gear; and Printed Circuit Materials for wireless infrastructure, power amplifiers, smart antennas, and radar systems for automotive and defense applications. Headquartered in Connecticut (USA), Rogers operates manufacturing facilities in the United States, China, Germany, Belgium, Hungary and South Korea, with joint ventures and sales offices worldwide.